The Makgadikgadi Pans National Park includes only a small portion of Ntwetwe Pan, with most of the salt pans themselves being outside the national park. The Park includes diverse habitats such as riverine woodland along the Boteti River, dense scrubland, open grassland and palm trees and salt pans far to the east. The Boteti River, the western boundary of the Makgadikgadi National Park, serves as a drainage system for the Okavango Delta, carrying water through the dry Kalahari to Lake Xau. The Boteti area in the west of the park is known for hosting large numbers of zebra and wildebeest which begin moving from the salt pans to this area after the rainy season (around April/May) during their annual migration. An estimated 20,000 zebras, 8,000 wildebeest and hundreds of elephants gather along the Boteti in search of water during this time, staying until the rains begin later in the year (October/November) when the zebra and wildebeest move back towards the salt pans. In the early 1900s the riverbed ran dry but in the last few years the Boteti River has started flowing again. The result of this constant water supply is that the migration disperses along the river banks rather than concentrating in large numbers at the waterholes along the riverbed as in drier years. There are two lodges found in the Boteti area: Leroo la Tau and Meno a Kwena. 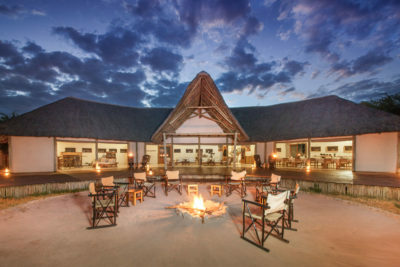 Both offer game viewing over the Boteti River, as well as game drives in the Makgadikgadi National Park. The Boteti is quite a distance from the salt pans so excursions to the pans are only recommended with an overnight there when staying three or more nights in the area, due to the long distances between the Boteti River and the salt pans. Meerkats in the area are not habituated so cannot be interacted with by tourists, unlike at Ntwetwe Pan.